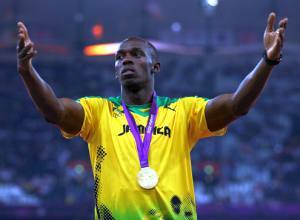 Usain Bolt of Jamaica became the first man in history to defend both the 100 meter and 200 meter Olympic sprint titles. Carl Lewis was not able to do it. Jesse Owens could not do it because World War II cancelled the 1940 Olympics preventing Owens' chances to repeat. Bolt gave the world its awe-inspiring Olympics moment and became the sport’s truly legendary figure. This feat was as rare as a bolt of lightning striking twice. Bolt became the first athlete to hold both the 100 meters and 200 meters world records. Together with his teammates, he also set the world record in the 4×100 meters relay. He is the reigning Olympic champion in these three events, and a five-time World and five-time Olympic gold medalist. He then became the first track athlete ever to achieve the "double double" by winning 100 meter and 200 meter titles at consecutive Olympics in Beijing 2008 and now in London 2012. His 2009 record breaking margin for 100 meters, from his previous record of 9.69 to 9.58, is the highest since the start of fully automatic time measurements. His incredible achievements in sprints have earned him the media moniker "Lightning Bolt" and awards including the IAAF World Athlete of the Year, Track & Field Athlete of the Year, and Laureus Sportsman of the Year. He is the highest paid athlete ever in the world of track and field. Before the 2012 Summer Olympics in London, Bolt came in second at the Jamaican trials in both 100 meters and 200 meters. However, at the 2012 Olympics, he won the 100 meters gold medal with a time of 9.63 seconds, setting a new Olympic record for that distance and defending his gold medal from the 2008 Olympics. He was followed by fellow Jamaican, Yohan Blake, who won silver with a time of 9.75 seconds. Richard Thompson of Trinidad and Tobago declared "There's no doubt he's the greatest sprinter of all time", while USA Today pronounced Bolt as a Jamaican "national hero", when his win came in time for Jamaica to celebrate its 50th anniversary of its independence from the United Kingdom. With his 2012 London win, Bolt became the first man to defend an Olympic sprint title since Lewis in 1988, and only the third sprinter in history to do so. Bolt followed his success with an impressive performance in his defense of the 200 meters gold medal with a time of 19.32 seconds, followed by fellow Jamaicans second-place Blake at 19.44 and bronze medalist Warren Weir at 19.84. When Bolt crossed the finish line, he did five push-ups, one for each of his gold Olympic medals. Anaso Jobodwana of South Africa compared Bolt to a "ghost who disappears in front of you."